I love discovering new things to play with in the kitchen. 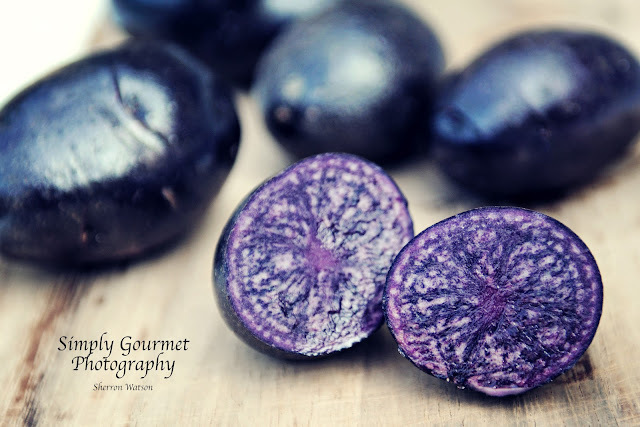 Discovering these purple potato's was so much fun! I had never done this before and it made a world of difference. I was not letting my oil get hot enough and this was not producing a crispy chip. Well, I now know and these will be made again! I bought a huge bag not realizing just how many slices you can get out of one of these cute things…LOL I used the remaining potatoes for our St. Patty's Day dinner with our corn beef…delicious! I will tell you that if you don't have a mandolin than I would try to borrow one or go buy one. Having my chips all the same width was nice. It meant they all cooked relatively at the same speed. The other thing that you want to ensure is that your slices are patted dry. Mixing water with the oil creates bigger bubbles while frying and this can become dangerous if you are not cooking these in a large enough pot. I actually play it safe and usually use a larger pot than I need to be on the really safe side. I can tell you that these chips lasted less then 10 minutes at my house. My family loved them and it was a fun treat to share. 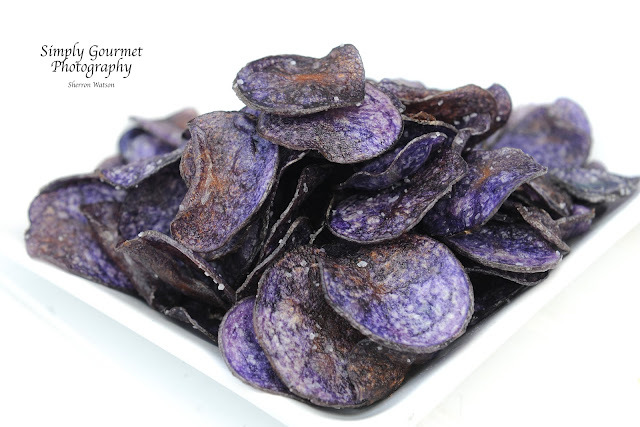 I used Kosher salt because I loved seeing the grains of white salt on the purple back drop. 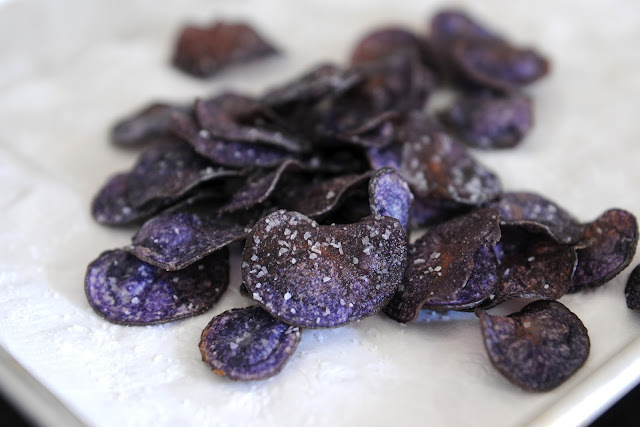 So I am encouraging you to try and find purple potatoes and surprise your friends or family with purple potato chips. IF….that is a big IF…you have left overs, make sure you put them in a sealed bag or they may go soft. I live in a humid state and this happens with everything that we leave out or open. This is David Leite's recipe from Leite's Culinaria. His site and original recipe can be found here. My notes are in red. Peanut or canola oil for frying I used canola. 1. Pour enough oil to reach a depth of 2 3/4 inches in a deep fryer or a large, deep pot. Do not overfill the fryer or pot as the oil will bubble up when the potatoes are added. Heat the oil to 325°F (163°C). Line a baking sheet with a paper bag cut open or with a wire cooling rack and place it next to the stove. Reaching this temperature takes longer then you think, this was my error in the past. Using a thermometer made a huge difference for my chips. 2. Meanwhile, set up a turning vegetable slicer with the straight blade. Cut off both ends of a large baking potato and attach one end of the potato to the grip at the end of the handle; the other end of the potato should sit flush against the blade. Turn the handle, pushing toward the potato with gentle pressure. The potato will rotate through the blade, forming extremely long ribbons of potato. I used my mandolin set on the smallest width and sliced them into a bowl of water. With 5 small potatoes I got about 3 cups of chips. 3. 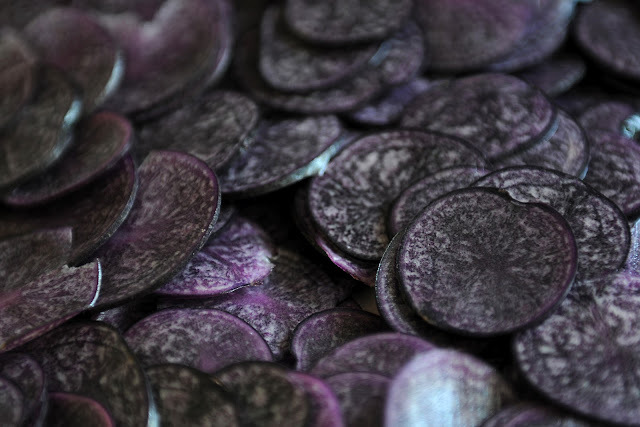 Place the potatoes on paper towels and pat dry; they should be very, incontrovertibly dry before they go into the hot oil, as any residual moisture will cause the oil to bubble up and spatter even more. 4. Carefully add some of the potato ribbons to the hot oil, working in batches. Add only enough potatoes to make a layer that is no more than 2 inches thick. Fry the potatoes until they are golden brown on the bottom. Using long tongs, gently turn the potatoes over. Continue to fry until the potatoes are evenly browned and crisp, about 6 minutes total, depending on the thickness of your ribbons. I found with the purple potatoes, I knew they were done when they started to turn a slight brown color on the edges and middle…but not too much or you will burn them. 5. When the potatoes ruffles are done, use tongs to carefully lift them onto the paper bag or rack to drain. Serve the ruffles on a platter with a generous sprinkling of fleur de sel. I found that the oriental round wire scoop that I bought to remove tempura veggies worked great to remove the chips.